Translucent blue plastic. Man, those guys at Apple have a lot to answer for. Ever since they used it as a design trademark on the first i-Mac's, it seems impossible to buy anything without the damned stuff. 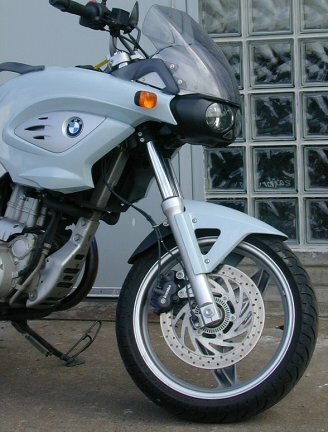 OK, so toasters and CD players with blue plastic I can handle, but not motorbikes. Please. And that, I confess, is why I have ignored BMW's F650SC for so long. I just found it hard to take this bike seriously. On paper it was undeniably interesting, but lumbered with the stupid "Scarver" tag, the baby blue and puke orange colours, and those see-thro blue plastic fittings, I just could not bring myself to ride the thing. Yet all it took was change of colour. Last week I saw one in simple black and silver, and I suddenly just had to ride it. By now you all know all the tech stuff, so I'll spare you all the 650 single, fuel injected, M3 valve gear, fancy belt drive stuff. Because the bike is a development of the 650GS, and the old Funduro before it, I had this mental image of some kind of big trailie. I went to ride it thinking it might make a good change from my Honda 650 Transalp. Boy was I wrong, this bike gave me the biggest surprise I have had on two wheels in quite some while. As soon as my bum hit the seat I knew this was no trail bike. You sit quite low down, feet tucked up, and a moderate stretch to the bars. The high tech single still sounds like a bag of old bolts when you fire it up, but crack the throttle, there is a delicious parping intake roar as the revs climb, and then it just sings. Once it hits its stride, it is hard to tell how many cylinders it has. For the hour or so that I rode it, I had the throttle pinned back on every possible opportunity, just to hear that noise and revel in the stepless power delivery. Save for a bit of shimmy on some bumpy stuff, (fork flex maybe? ), it handles like a baby sport bike too. Sticky tyres, good turn in, instant power delivery, great brakes, ABS, all make for a bike that is easy to ride hard and safe. Being a modest 650 means that you are not pulling the big-speed numbers you get with the latest hyper-tackle. This is a real world sport bike, great on back roads, fast enough to tackle motorways, but with out the pointless warp-drive capability that you get with all the litre plus stuff these days. None of this will impress Joe Power Ranger and his clone mates bragging at the bar, but this is a new breed of bike that deserves your attention. It feels to me like a scaled down Buell X1, all acceleration, brakes and corners. You might even say that it shares some of the Buell's "I don't give a stuff" attitude to looks too. Look for one in silver and black, as it looks far better than the blue one that I rode, but to be honest I had so much fun riding this little hoon that I forgot all about the colour. And the translucent blue plastic? ... I never even noticed.